An extensive platform of ester bases and viscosities to expand the range of substrates that cyanoacrylates will bond. The expertise to formulate our cyanoacrylate products for special applications. Dolphin G.P. is a single component low viscosity cyanoacrylate adhesive. It is a fast setting wicking grade adhesive ideal for bonding preassembled parts. Dolphin G.P. 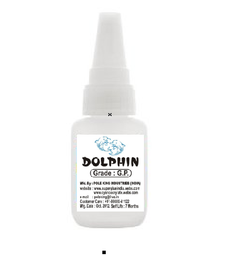 is a single component High viscosity cyanoacrylate adhesive. Super fix is leading instant adhesive brand, also known as the ‘chutki mai chipkai’. It s ability to bond a variety of surfaces in a matter seconds makes it a handy home and industrial adhesive. Super fix is available in a variety of pack sizes and can be bought at all types of outlets like hardware stores, kiranas, medical shop, stationary outlet, etc. Super fix is manufactured by POLE KING INDUSTRIES.